It's been along time I didn't make fried rice for Eliot.He love Young Chow Fried Rice aka Combination Fried Rice.Recently we had dinner at Joe's Shanghai in Flushing,NY and I order this dish for him..Two days later I make this dish for him again since I have left over roast pork...I garnish with some tomato from my garden..Fried rice is the most simple and easy Chinese dish to cook!! 1:Prepared wok at high heat with oil for scramble eggs.Removed egg from wok after 3-4 minutes.Add in roast pork and shrimp ,stir fry for 2 minutes before add in overnight rice. 3:When you see your rice are not sticking together,then it's ready to serve.. If you miss Young Chow Fried Rice badly or can't find any Chinese restaurant nearby,try out this recipe:)..You can add in ham,chicken or beef....how about some left over cold cut like turkey,ham and etc....? 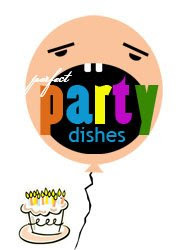 ?I "m bring this dish to dhanggitskitchen Perfect Party Event for her little one.See you there! Make sure your overnight white rice is not too wet or sticky..The best grains for fried rice is long grains or jasmine rice..
Back in Philippines there is no family gathering we celebrate without a rice dish. Thanks for this wonderful idea you gave me for my daughter's celebration! I'm sure my French guests will love this!! This is truly an all-time favorite! Beautifully presented!! And looks absolutely delicious! That's the prettiest fried rice I've ever seen! How did you get it like that? Did you pack it into a little dish? Of all fried rice Yong Chow Chow Fun is my favorite. Beautiful fried rice. Your yong chow chow fun looks good, it my son favourite & mine too. Fried rice is one of my favorite quick goto meals. I like the bowl shaped presentation.